The Seethei Amman Temple in Nuwara Eliya, said to be the only temple in the world dedicated to Sita of Ramayana fame, was until last year a small unpretentious structure. Within its walls were statues of Rama, Sita, Lakshmanan and Hanuman. Today, the statues have been removed to a temporary shelter on the side, while a large ornate new kovil is being built in place of the old one. Beside the site of the old temple, a second kovil dedicated to Hanuman is also nearing completion. 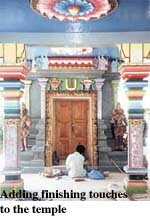 It is believed that the Seetha Kovil began as a small temple under a tree, although its date of origin is not known. "Recently, when we demolished it for rehabilitation, we found a coin dating back to 1894. It was then we realised that the temple was over 100 years old," Mr. Radhakrishnan, Chairman of the Board of Trustees said. The Seetha Eliya Temple became the subject of a recent controversy when the Ministry of Tourism mooted a proposal for the development of Seetha Eliya as a Holy City. It was proposed to vest 35 acres of land surrounding the temple in the Tourist Board and develop it as a sacred area similar to Anuradhapura and Kataragama. That proposal has now been shelved in the face of protests from people in the area and environmentalists. The proposal aimed at preserving Seetha Eliya as a place of legendary importance and creating a new place of worship and religious importance for Hindu devotees. Another aim was to attract Indian tourists. It was also proposed to establish a link between Seetha Eliya and Ayodhya in India, the kingdom of Rama where thousands of devotees visit every year. It was hoped to use land behind the temple, upstream and downstream, belonging to the Forest Department as well as some acres from private properties across the road for a vehicle park. This land was to be acquired and vested with the Tourist Board initially for development purposes and then transferred to the Trust, when the project was in full operation. The Tourist Board estimated that around 200,000 Indian tourists and 100,000 Sri Lankan tourists visiting Nuwara Eliya for an average of two nights would inject a minimum of a billion rupees to the Nuwara Eliya economy. Development Director of the Tourist Board —Mr. Selvam said the idea for a pilgrim centre at Seetha Eliya was first suggested by an Indian team that was hosted to a familiarisation tour of Sri Lanka, two years ago. Rama, one of the most widely worshipped Hindu deities, is venerated as a reincarnation of Lord Vishnu. Special worship of Rama started around the 11th century and by the 14th and 15th century, distinct sects appeared venerating Rama as the supreme god. There are many temples dedicated to Rama in India.The image of Rama is usually attended by figures of his wife Sita, his half-brother Lakshmanan and his monkey devotee Hanuman. Historically, it is possible that Rama was an actual tribal hero of ancient India who was later deified. The story of Rama and Sita is related briefly in the Mahabharatha and at length in the Ramayana. According to the Sanskrit epic poem the Ramayana, Rama was of royal birth in the kingdom of Ayodhya. At the bridegroom tournament of Sita, the daughter of King Janaka, Rama succeeded in bending Shiva's mighty bow, thus winning Sita for his wife. After his banishment from his position as heir, due to an intrigue, Rama retreated to the forest with his wife and his favourite half-brother, Lakshmanan, to spend 14 years in exile. Ravana, the demon king of Lanka, then carried Sita off to his capital while her two protectors were pursuing a golden deer sent to the forest to mislead them. Rama and his brother set out to rescue Sita. After many adventures, they finally succeeded with the assistance of the monkey general Hanuman. Rama slew Ravana and rescued Sita. The Ramayana records that when Sita was brought to Lanka by Ravana, she was held captive at the Asoka Vanam or forest, which many believe is on the mountain, some distance away from the temple. Behind the temple is a stream. Water flows over a basin like depression carved in the rock. It is said that Sita came through a tunnel to this stream to bathe. The construction of the new Sita temple started last April and is scheduled to be completed in August this year. "This temple was not well known. We have to make it famous," says Praba, in charge of supervising the renovation. Many tourists who visit the Hakgala Gardens, stopover to see the temple, since it is en-route from Nuwara Eliya to Hakgala. An average of 1500 local tourists and 1000 foreign tourists stop by the temple each year. During Thai Pongal, in January many devotees from the tea estates nearby visit the kovil to perform poojas, he says. "In January, we had a Festival of Unity organised by the Manoj Mody foundation of India," Mr. Radhakrishnan said. About 800 devotees came to Nuwara Eliya for a 10-day bajan programme. About 500 local devotees also joined in. They occupied all the hotels in the area and attended the poojas daily at the temple. Since space was insufficient, a tent was put up at the Buddhist temple nearby, to accommodate the crowd. "Although there are many Rama and Hanuman kovils in India, there is no kovil dedicated to Sita. This is the only place where Sita came alone. In all the other places Sita is associated with Rama. North Indians worship Rama and they are keen on developing the Sita Kovil with our support," Mr. Radhakrishnan said. "The estimated cost of building the temple is around Rs. four million. We have collected the funds through public donations. Tills are also placed outside the temple for collections. The Manoj Mody foundation gave about Rs.200,000 for the renovation. They plan to come in August for the opening of the new kovil, bringing with them four new statues made in Jaipur at a cost of Rs.500,000. The construction of the Hanuman Temple was done by the Sri Lanka Army," he said. Former Army Commander General Rohan Daluwatte said the Army got involved in the construction of the kovil, together with the people of Nuwara Eliya, because they felt it would promote better understanding between the Sinhalese and Tamils. He also said it was a gesture of goodwill towards the Tamils in the area, who had helped build a Buddha statue. At the construction site, a team of ten experienced Indian temple construction workers led by G. Ravishankar was working on the new kovil and the many statues that adorn it. They are assisted by local labourers. Ravishankar has studied temple construction and sculpture for eight years at an Indian university. He said they use a mixture of cement, sand, water, crushed bricks and pieces of iron rod for the statues. The Indian workers are in Sri Lanka on a two year visa which they expect to extend further. "Minister Thondaman is very supportive," Ravishankar said. The Government Agent for Nuwara Eliya, Dhanasena Hettiarachchi said, before the "Unity" function was held in January with the participation of Indian devotees, environmental and Buddhist organisations had staged a massive protest. "The people had feared that the 800 devotees expected, were from South India, although they were in fact mostly from North India where there is a strong following for Rama. The Buddhist organisations set down various conditions for holding the ceremony. These were adhered to and the ceremony was held peacefully," he said. "I have been G.A. in Nuwara Eliya for six years and served as a government servant for 25 years. We do not have petty differences here. Buddhists, Hindus and Christians live together peacefully," he said.